have been longtime supporters of Everglades restoration. Pepe Fanjul Jr. manages the company's land assets. 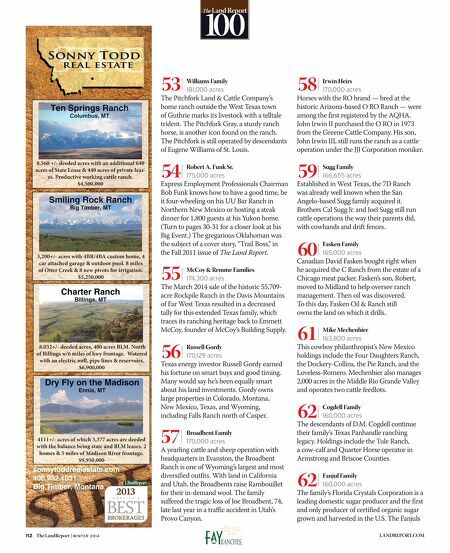 JA Ranch Heirs 158,500 Acres Founded in 1876 through a partnership between Irish businessman John Adair, Cornelia Adair, and Charles Goodnight, the JA is the oldest continuously operated family cattle ranch in the Texas Panhandle. Today, operations are overseen by fifth-gen- eration family member Andrew Bivins, who uses GPS technology to manage the sizable ranch. The JA's pioneering efforts earned a 2013 Lone Star Land Steward Award from the Texas Parks and Wildlife Department. Ellison Family 152,000 acres In the 1930s, Stanley and Mae Ellison came to Elko County, Nevada, to manage their family's ranching company. 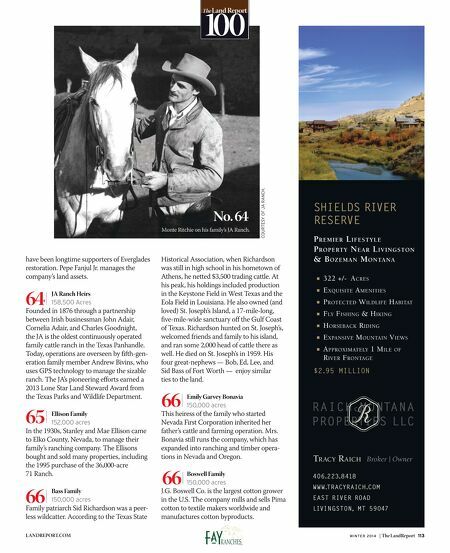 The Ellisons bought and sold many properties, including the 1995 purchase of the 36,000-acre 71 Ranch. Bass Family 150,000 acres Family patriarch Sid Richardson was a peer- less wildcatter. According to the Texas State Historical Association, when Richardson was still in high school in his hometown of Athens, he netted $3,500 trading cattle. At his peak, his holdings included production in the Keystone Field in West Texas and the Eola Field in Louisiana. He also owned (and loved) St. Joseph's Island, a 17-mile-long, five-mile-wide sanctuary off the Gulf Coast of Texas. Richardson hunted on St. Joseph's, welcomed friends and family to his island, and ran some 2,000 head of cattle there as well. He died on St. Joseph's in 1959. His four great-nephews — Bob, Ed, Lee, and Sid Bass of Fort Worth — enjoy similar ties to the land. Emily Garvey Bonavia 150,000 acres This heiress of the family who started Nevada First Corporation inherited her father's cattle and farming operation. Mrs. Bonavia still runs the company, which has expanded into ranching and timber opera- tions in Nevada and Oregon. Boswell Family 150,000 acres J.G. Boswell Co. is the largest cotton grower in the U.S. The company mills and sells Pima cotton to textile makers worldwide and manufactures cotton byproducts. 64 | W I N T E R 2 0 1 4 | The LandReport 113 LANDREPORT.COM The L and Report 100 65 | 66 | 66 | 66 | Monte Ritchie on his family's JA Ranch. No. 64 COURTESY OF JA RANCH.